Retail Math 101 – Not the sexiest title to ever cross your news feed, but this is an area where you absolutely need to have clarity and understanding. After all, my guess is while you love your shop, you’re also in it (just a little bit) for the money. Everyone here loves Pitch Perfect, right? Awesome – moving on to the good stuff. Now there are A LOT of retail math terms, it’s in and of itself a completely different creature than the typical math you learned in how they classify and think of the inventory owned. 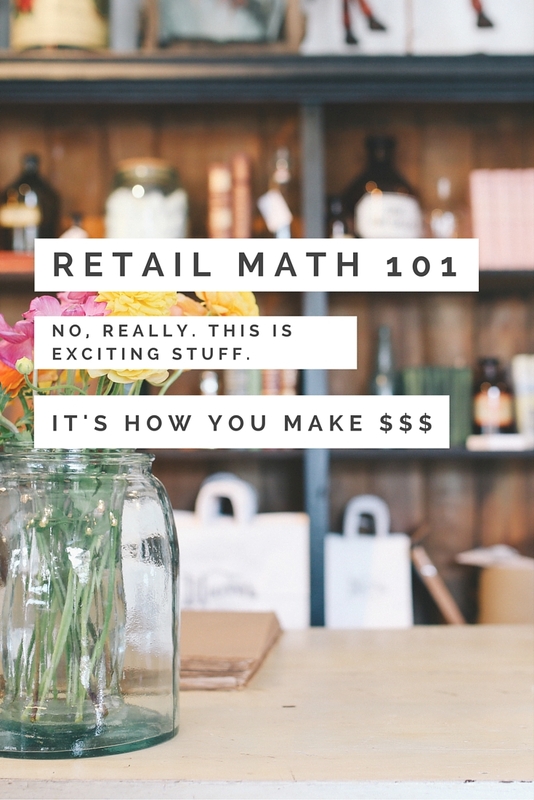 So today, we’re going over retail math 101 basics so you can feel confident at trade shows, vendor meetings and discussions with other business owners. It’s retail math made simple. 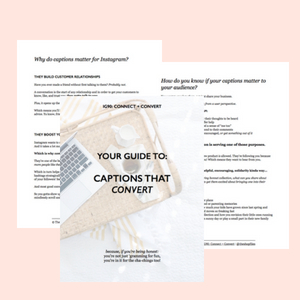 If you’re looking for more information on selling wholesale, check out this post on 24 Wholesale Terms You Need to Know – It includes examples and guidelines, plus a free worksheet to create your own wholesale business terms. Price set by the retailer to sell its merchandise. If selling wholesale, this may also be referred to as the MSRP, or manufacturer’s suggested retail price. So it’s the retail price you’d recommend the retail sell your product for in-store. Amount paid to the vendor, plus or minus any additional fees to acquire the goods (freight/shipping, taxes). The difference between the price you paid and what you charge your customers. The average price an item sold for. Similar to IMU%, however it uses actual sales or revenue, instead of sale price, so this is after items have sold. Sounds like what it is. Your current units in stock. Stock (same as inventory) is the value of your goods and is typically discussed in terms of “retail dollars” instead of at cost. If you carry more than one price point in your shop (I’m sure you most likely do), it’s the total value of your goods. Inventory at Cost would be calculated the same way except use the (cost * units owned) instead. A component used to determine the health of inventory in Turn measurement. It is seen as a more accurate assessment, as most shops have fluctuations throughout the year. Calculation depends on the time period, but often done on quarterly, seasonal, or yearly basis. BOM = Beginning of Month, EOM = End of Month. In this example, we’ll do an analysis of our Spring season (Jan-June). Why do we include the beginning of retail in January? We need to review all inventory owned throughout the sixth month period, if we only started with January EOM, we would be missing any information that happened during that time which would affect future calculations. Average Inventory at Cost is the same calculation except you would use Inventory at Cost BOM and EOMs instead. This is THE number that was used to determine bonus payouts, so you better believe it’s important to the health of a company. This is your return on capital investment. If you’re looking for more information on growing your business, sign up for early access to Pricing for Profit. You’ll be first on the list once the worksheets + guides are ready! Let’s do this, profitably >>> Sign up here. This measurement shows you how well your inventory is selling relative to the amount you carry to achieve those sales. It can be an abstract concept, but essentially it’s a good measurement of a healthy business (meaning you’re carrying an appropriate amount for the sales you do), although a good turn rate can mean very different things by category or shop. We’ll discuss that more in another post…this is getting too much, no? The amount sold versus inventory brought in. Helps you review and forecast your inventory needs in relation to your sales trend. It can be a super easy indication of when you’ll need to place an order based on your vendor leadtimes. So in our current example, if your vendor or production leadtime was 4 weeks, you’d be projecting to run out of inventory before the next shipment arrives! This sounds important, no? This is when profit earned equals your fixed expenses. No profit has technically been earned yet, but this establishes the point when you’ll start “taking money to the bank”. Phew! So I think that’s enough for today. You’re officially graduated from Retail Math 101. If you have any questions on these retail math examples or definitions, please reach out. I want you to walk away from this feeling more confident on the financial side of your business. Often this is easier to talk through with specifics, so let’s hear them. Leave a comment below or shoot me an email at kate@theshopfiles.com! I have a shop called Wild Rogue Botanicals on Etsy and also a website. I make all natural body care products and wondered if I’m pricing things correctly for retail. I generally mark things up 6x so for wholesale I would be making 3x. That is only considering my cost of goods and not including etsy fees, any paid advertisements, my labor, etc. I would love to hear your thoughts! Hi Larissa! I would definitely include your labor cost in your cost of goods and develop your markup strategy from there. Otherwise I’m concerned at wholesale you’ll essentially be working just to barely get paid, without any profit to help offset other activities or earn “business income” overtime. Treat yourself just like you would an employee and set an hourly wage. If you have any other questions please let me know! Thank you so much for your input Kate! I really appreciate it.